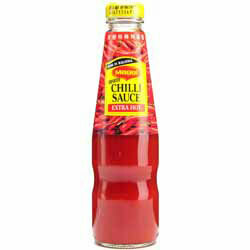 Extra Hot Chilli Sauce is very versatile. Use it as a 'hot' dipping sauce as well as for cooking. Ingredients: Hot Chillies (36%), Water, Sugar, Tomato Paste, Salt, Modified starch, Garlic, Onion, Ginger, Flavouring.